MARY POPPINS Backdrop Collection Now Releasing! After you secure the rights to MARY POPPINS from Music Theatre International it is time to start designing your stage. Based on a combination of the original novel and Disney’s cinematic adaptation, the theatrical medium was penned by Julian Fellowes, with a score by the much-acclaimed Sherman Bothers, Richard and Robert. The Sherman brothers retained all of your favorite musical numbers from the movie, while Fellowes added in a little English charm of his own. Since the show opened in 2006, it has graced over 2,000 theatrical venues throughout the world. Now, you can share this popular tale on your stage. Our Creative Team has developed a show package of MARY POPPINS backdrops that are all inspired by this wonderful tale. Our package is available right now and is ready to support all of your supercalifragilisticexpialidocious needs, scene by scene. The opening scene of the show features everyone’s favorite chimney sweep, Bert, taking a stroll down Cherry Tree Lane, home of the affluent Banks family. Our Grand Victorian Row Homes backdrop was developed to assist in setting this, and other, key scenes in the production. Featuring cheerfully colored and architecturally correct Victorian era housing, this drop gives you a hint of the stylized interpretations of MARY POPPINS, while still maintaining a realistic feel. Aside from the opening of the production, this drop could easily be used to support any of the other scenes in the script that take place at the Banks’ residence. No package of MARY POPPINS backdrops would be complete without a proper park. In Act I, Mary brings the Banks children to their local park, where they first meet Bert. Our Director’s Roundtable recommends using your actors that will become dancing statues for the musical number, Jolly Holiday in place of set pieces along with our Victorian Park backdrop to set this scene. If you are seeking a realistic portrayal of the show, then this is the only drop that you will need for your park scenes in either Act. If you want to be a bit more stylized, the Victorian Park can be switched out for our Daisies and Flowered Grass backdrop for the performance of Jolly Holiday, as many Directors have decided to adjust their sets during the musical number to better mimic the cartoon sequence from Disney’s movie. This backdrop features realistic bluegrass and brightly colored flowers, but presents them in a larger than life fashion, making it ideal for visually conveying your cast’s brief stint in a more fantasy-based world. Our Victorian Bedroom backdrop was also developed to accommodate multiple scenes in MARY POPPINS. 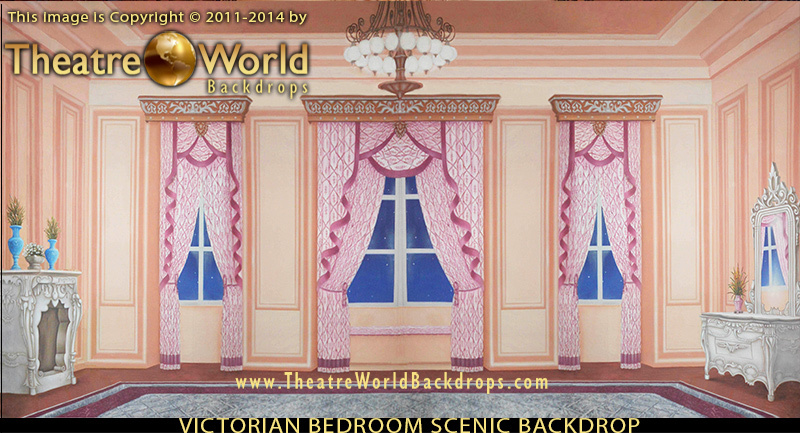 Similar to our Grand Victorian Row Homes, this backdrop accurately depicts the interior of a Victorian era home with a combination of pink and cream hues. Our Creative Teams have limited the amount of furniture in the drop by design. This allows you to utilize a single backdrop for every scene that takes place inside of the Banks residence. Your choice of set pieces will transform this interior into a parlor, living room, and bedroom as needed throughout the script, while keeping your budget in mind. If you have a different vision for the Banks home or would like to change between backdrops for each scene that takes place there, we invite you to search our collection of interior backdrops. It contains scenic options such as a Victorian era parlor, as well as a wealth of unique mansion interiors. As is a theme with MARY POPPINS, your stage will play host to Mr. Banks’ workplace in both acts. Our Creative Team toiled to develop a backdrop that embodied the opulence and wealth Fellowes intentionally wrote into the show. Our Bank Interior backdrop is laden with shining marble, shimmering gold, and a gorgeous chandelier. Simple set pieces, such as a desk and chair, are all you need to support the bank scenes. Saint Paul’s Cathedral is one of London’s premier architectural triumphs. Furthermore, it was specifically written into MARY POPPINS for the performance of “Feed the Birds”. Inspired by the beauty of this structure, our Artistic Team set out to create a lifelike backdrop featuring this famed house of worship. While you could use another exterior to support this musical number, our team prefers adhering directly to the script and deploying this drop. However, we would love to hear your thoughts and alternative imagery options in the comments. Our Olde Time Candy Shoppe backdrop will take you straight to Mrs. Corry’s magical store for your production’s rendition of Supercalifragilisticexpialidocious. We set to accurately portray an early 1900’s candy shoppe with this drop. It will give your cast all of the scenery that they need to purchase their “ounce of conversation”. 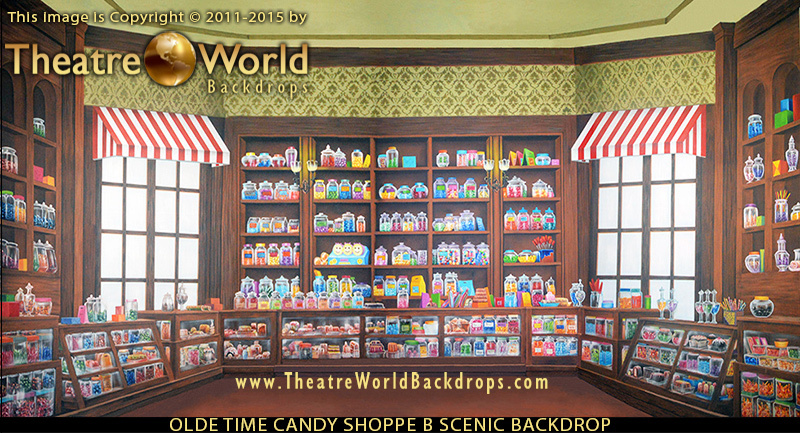 If this particular design is not exactly on the mark, our Olde World Candy Shoppe – B backdrop provides similar imagery. The main difference is the addition of wrap-around display shelving, which adds some extra depth to your stage. 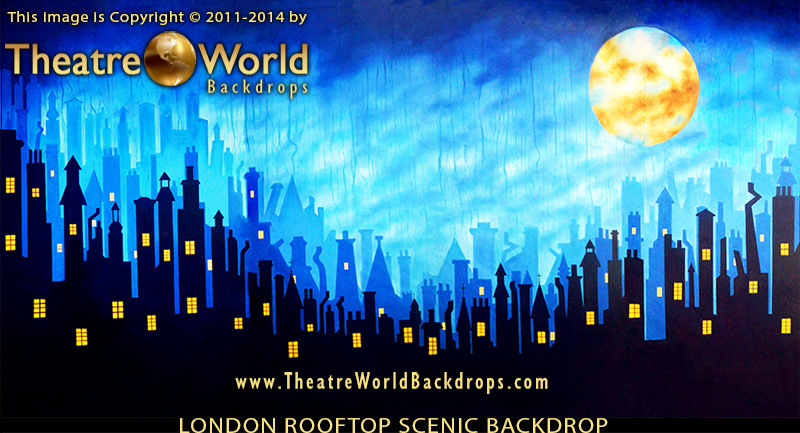 Finally, our London Rooftops backdrop perfectly supports one of MARY POPPINS’ most recognizable scenes. We were inspired by imagery from touring productions–but, of course, we gave our version a substantial TheatreWorld twist. This drop depicts a stylized vision of London’s skyline. An abundance of chimneys and a truly gorgeous full moon complete this whimsical drop. Many Lighting Directors opt to focus several different colors of stage lights on the drop and switch between hues as the cast performs Step in Time. With your chorus decked out as chimney sweeps, dancing alongside Mary, Bert, Jane and Michael, the scene needs little else. Directors have a myriad of options when it comes to selecting the right backdrops for MARY POPPINS. Truthfully speaking, there is no “right” choice. While our Creative Team has developed a show package that spans all of the key scenes, it is your vision that will ultimately dictate your scenery. We hope that this article helps you to begin tackling set design. Regardless of how you picture the show, TheatreWorld has just the backdrop that you are in search of. This entry was posted in Disney Themed Backdrops, Latest Backdrops, Mary Poppins Backdrops, New, News You Need, Theatre Backdrops, Updates and tagged cherry tree lane, Disney, london, MARY POPPINS backdrops, musical theater, musical theatre international, new backdrop rentals, professional backdrops, saint paul's cathedral, Scenic Backdrops, stage backdrops, TheatreWorld backdrops, Theatrical backdrops, theatrical rentals, victorian on October 31, 2014 by Skip Mathews.